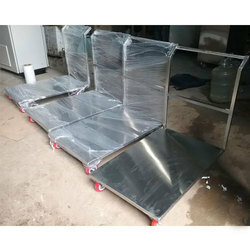 Leading Manufacturer of stainless steel platform trolley from Pune. Our organization is highly appreciated in the national market for manufacturing and supplying a wide range of superior quality Stainless Steel Platform Trolley. Designed & developed using high-quality stainless steel, these plate form trolleys are available with us in numerous finishes, standards, grades, and sizes. Our patrons’ can avail these plate form trolleys from us at competitive prices.